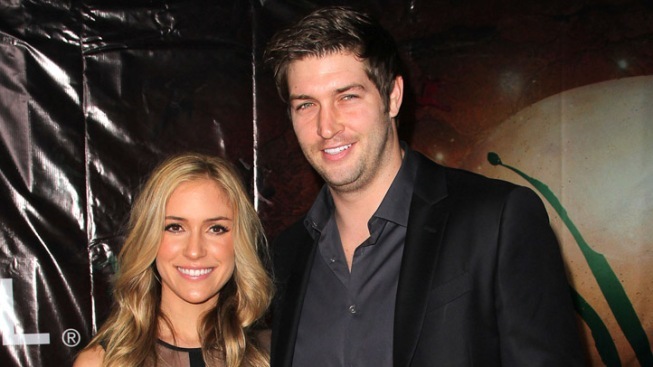 Kristin Cavallari and Jay Cutler are expecting a boy, the Chicago Bears quarterback's teammate told a radio show on Tuesday. "The Hills" star Kristin Cavallari and her fiancé, Chicago Bears quarterback Jay Cutler, are expecting a baby boy, Cutler's teammate says. Bears wide receiver Earl Bennett shared the news on "The Boers & Bernstein Show" Tuesday in Chicago, saying Cutler has plenty to be happy about these days. "New toys, a baby on the way — he's having a boy — I'm excited for Jay," Bennett said on the radio show, the Chicago Tribune reported. "It's a great time." Cutler, 28, and Cavallari, 25, haven't confirmed the news from Bennett. Cavallari has been debuting her growing belly lately and admitted that for the first time ever, she can't fit into sample size dresses. The long-time pair were supposed to have wed last year but called off the wedding and split briefly before reuniting in November. They announced in January that they were having a baby and soon got engaged.